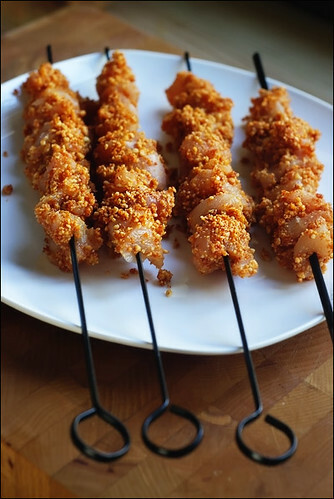 If you use wooden skewers, wrap the exposed parts in foil. The old fashioned way was soaking them in water for 30 minutes, but really, this doesn’t prevent them from burning. My mortar & pestle or my spice mill? I was really on the fence about it, but didn’t have enough time for too much manual labor, so my spice mill won. You can use your food processor, blender or magic bullet for this as well. Add one cup roasted peanuts, pop the lid on and pulsate several times until you end up with a coarse powdery substance. Be careful not to overdo it or you’ll end up with some strange kind of peanut butter! Now add (in no particular order) 1 tsp paprika powder, 1/2 tsp onion powder, 1/8 tsp hot chili powder (up it if you like it hot), 1 1/2 tsp salt and 1 tsp sugar. Also get 2 tbsp grated ginger and 1 garlic clove (grated) in there. Put the lid back on and pulsate a few more times until everything has properly blended. Get it all in a bowl and use a fork to mix or break it up a bit. Officially you want to get a really fine spice rub, but I always keep the rub a bit coarser. I just like the contrast between the soft chicken and the crunchy peanut coating. You just don’t want to know how good this smells. Well, maybe you do. Most of the work is done now, there’s your spice rub. Pretty easy, eh? Cut up a few chicken fillets. You can replace the chicken with any kind of meat you like, so don’t feel like I pressured you into using chicken for a chicken Suya! Now would I do such a thing? Pour a little oil over the chicken cubes. I didn’t really measure, it was probably close to a tbsp. Now technically you can do this with a fork, but do you really want to get all technical about this? Nah, come on, dig your hands in there and do the hustle. Transfer the chicken to a bowl and cover with your spice rub. If it wouldn’t have been for the photos I wouldn’t have bothered using a spoon, believe me. Now mix it all up and allow it to sit for a while. I usually let the flavors incorporate for roughly 30 minutes. Now wash your hands and make yourself a nice cup of coffee. I’ll wait. After about 30 minutes it’s time to get serious. Grab your skewer of choice – I’m going for these fancy black steel skewers. Now they’re probably gonna be a whole lot less fancy if I tell you they came with the kabobs I’ve ordered some time ago. For free. They work great! You can also do this reversed - first attach the chicken to the skewers and then sprinkle the spice rub, but for some reason I always do it this way. Now there are several ways to cook Suya. Traditionally they are (slowly) roasted over charcoal fire, but well, I’m in the Netherlands and we just don’t have charcoal fire weather here. You can use a BBQ, or you can cook them in a preheated oven (400F-200C) for 30 minutes. As for me, I like grilling them on my stove top. Then again, I like grilling everything on my stove top. First lightly oil the grill plate. Grill them over low heat until they’re golden brown. Flip them over every 2 minutes or so, you don’t want them to end up charred. Charred peanuts lose their charm quickly, I speak from experience. Depending on the size of the chicken and how hot your grill is, they should be done in roughly 10 to 12 minutes. While the Suya is cooking, finely slice a red onion. You can sautee the slices or use them raw. I prefer to use them raw in this dish. If raw onions are too strong a flavor for you, try putting them in really cold water for about 10 minutes, this will mellow them. Serve your Suya royally covered with the thinly sliced onion - traditionally you should also serve them with thinly sliced tomato on top. I’m not too crazy about that combo, though. I just like to eat them with baked potatoes and snap beans on the side, but that’s just me.